Let your spirit run free in a fleury of femininity Oh-so-floral fragrance, with notes of apple blossoms, meadow dew, fresh freesia, just-picked daisies and a touch of pillowy musk. Additional notes include mandarin flower, pansy, dandelion feathers and wood. 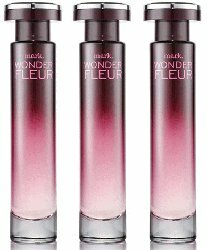 Mark Wonderfleur is available in 50 ml Eau de Toilette. *Wonderfleur appears to be unrelated to an older Mark fragrance of the same name.